Update 3.2 The Green Guardian is out! 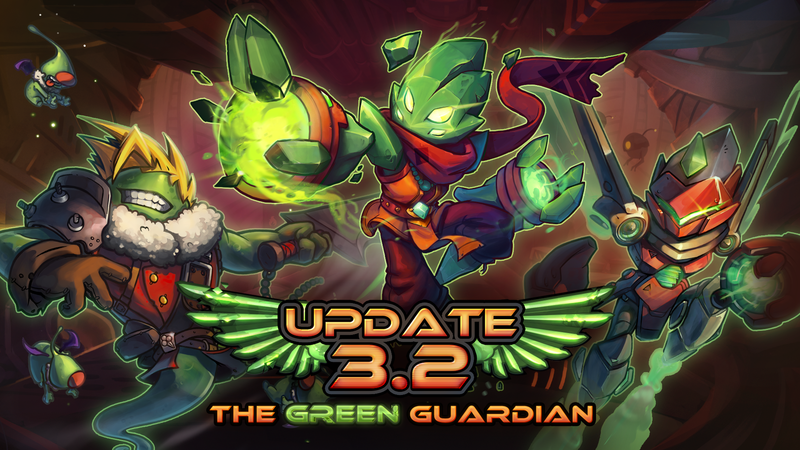 Awesomenauts 3.2: The Green Guardian has just launched on Steam! Ix the Interloper, a character that has been designed and picked by the community, is now available! And best of all, it’s completely free for everybody! Ix the Interloper is our latest support ‘Naut, and comes with the ability to bond with both allies and enemies. Once bonded, Ix can switch position with his target, allowing him to swap allies to safety and enemies away from their chosen location! Be careful though, because Ix is quite fragile and is easily taken out when hit by stuns or slows. His escape is a skill called Refract, which renders Ix invulnerable for a very brief period of time while being able to move freely in every direction. Update 3.2: The Green Guardian also contains a brand-new skin for Scoop, called Bravely Scoop IV: Eternal Fantasy, and a futuristic skin for Ix, called Steel Seraph Ix!